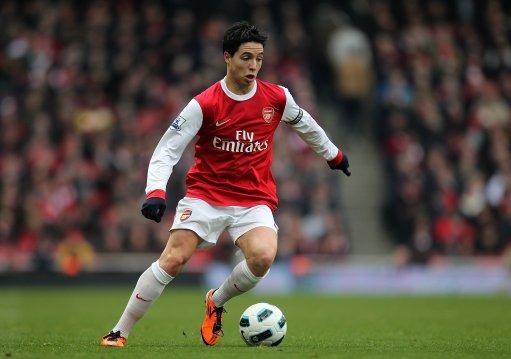 Arsenal's player of the season Samir Nasri says Arsene Wenger's side have nothing to fear when they travel to the Camp Nou to face Barcelona on Tuesday. The Frenchman believes the Gunners numerical advantage will aide them when they take on the Spanish champions rather than hinder them, because he feels the north London side will go out and play their own game. Critics have suggested Arsenal are in a tougher position than the Catalans because one goal would see Pep Guardiola's side go through to the quarter-finals. But Nasri, who is expected to start on the right of attack in place of Theo Walcott, says the Gunenrs will go out and play their own attacking game. "We have to believe in our quality and trust ourselves. "We don't worry about what the press say - in football everything goes quickly, one day to are the best and the day after you are the worst. "We know we can beat everyone and we are confident for... the trip to Barcelona. "It will be very difficult game at the Nou Camp but we have nothing to lose, we will play our game and approach it no differently than we always do. "We cannot play another way - we are a team that loves the football, just like Barcelona, and i think it will be the same kind of game you saw at the Emirates. "They'll have plenty of space and we'll have to catch them on the break."